It really shouldn't be this hard, but I have experienced it first hand: Finding a good desk lamp is tough, not to even mention finding one that is affordable and doesn't fall apart when you just look at it. The Tizio from Artemide is an iconic piece. Designed by Richard Sapper in 1972 it was a front-runner in contemporary design and has to its credit been manufactured unchanged ever since. With its 35 - 50W halogen lamp (and now also an LED option) and effortless adjustability in all directions it is a great task light. The 35W model shown here is good for a small desk, especially if you primarily use a computer and don't want to overpower the screen. If you are reading a lot, doing crafts or working on the latest killer sudoku the 50W option is a must. 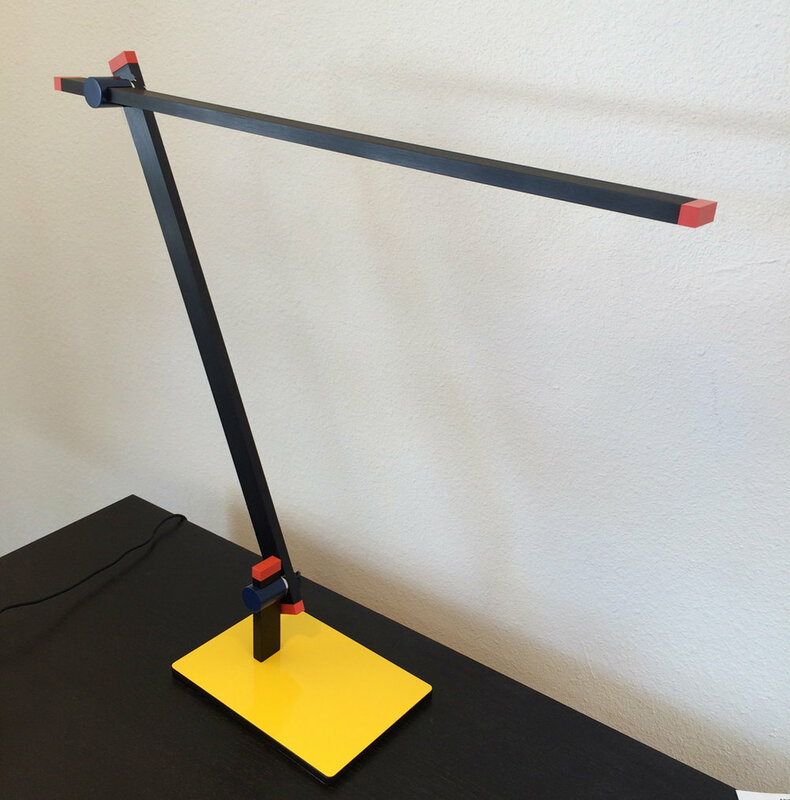 Love the design and cheerful colors of the Balance desk lamp! The Balance desk lamp from Modern Forms uses only 11W to produce 630 lumens, making it an energy saving choice for your computer desk. It is fully dimmable with fingetip touch dimming on the base, which adds to the clean design. No bulky driver visible, since it is located on the cord. 630 lumens is not incredibly bright, but definitely adequate as the only light next to your computer monitor. The Philippe Starck Archimoon from FLOS is another favorite desk lamp, just because the design is so unique. Again somewhat limited because of its max 40W halogen. Not terrible, but again not an ideal reading light. But I still want it! 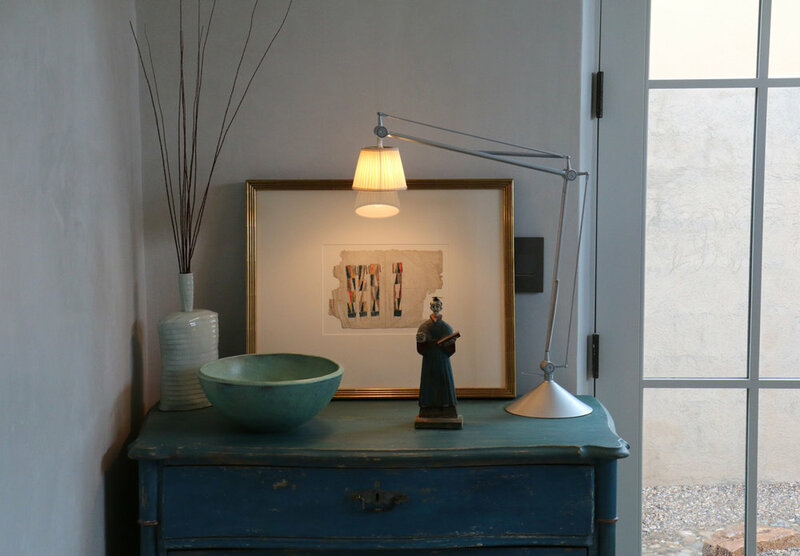 Even if it is only to use it in a vignette with treasured objects like here in one of our clients' home. As I am writing this I am sitting next to my trusted Tolomeo. I have Tolomeos all over my house. It's a big family with lots of variations from clip-on spots to floor lamps, pendants and desk lamps. The head comes in a few variations. This is the classic metal shade that takes a 75W incandescent lamp, well, took. Now we are using LED retrofit lamps in ours. Works just as well. Just stumbled across the Spanish manufacturer Marset at LightShow West and saw the charming Scantling desk lamp. I will definitely find a spot for it somewhere in my house. The use combination of different materials like wood and metal gives it a unique edge. Lamping: 20W CFL. Not my most favorite choice of lamping, but with this look, who can say no! Just in case you wondered: Scantling is an old measurement term used in wood or stone cutting. We'll show you how to change a pre-1993 Artemide Tizio lamp. What's not to love about the iconic Artemide Tizio desk lamp? It's pure form and function. The Louis Poulsen PH 3/2 has a reflective three-shade system, which makes it an ideal desk lamp. Joy of contrasts. This contemporary desk lamp surprises with its soft plisse cloth shade.